Auctioned on eBay in June 2004. This disc could date from any of the remix sessions listed below and would certainly have to be a stereo mix "folded" to mono. Here's a mega rare item for all Beatles fans!! 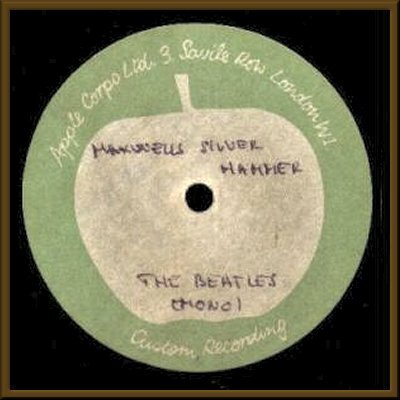 UK 10"acetate copy of "Maxwell's silver hammer",MONO recording in EX- condition with VERY light surface marks,plays EX !!! This is a different take than the offical release-chances of finding this gem are VERY slim, especially in such a nice shape! !